Exciting news! Carissa from At 350 Degrees and I teamed up this weekend to switch guest posts! I shared my Cloud Nine Pie, and Carissa shared this incredible Five Layer Ferrero Rocher cake that I would really love to stuff my face with. We’re pretty similar bakers, so check out all her other amazing looking recipes! Hello Teenage Cakeland readers! My name is Carissa. I’m a high school student with an unhealthy obsession with baking. Baking is my one-stop cure-all; despite a hectic life, I always find comfort in frosting a cake or making brownies to bring to school. Having a bad day? Bake. Want to make some friends? Bake. Need a new (and delicious!) hobby? Bake. For me, baking has always been both an art and a science, so let’s put on our lab coats and enter the kitchen! I made this beautiful cake for my sister’s birthday! Because I bake for every holiday, birthday, or even just Sunday night family dinners, my sister required that her birthday cake top them all. My first thought was an elaborate bright pink cake, but I had already covered that with my Pink Chocolate Ombre Cake, so I moved onto the next thought: a Ferrero Rocher layer cake! (Keep in mind that I had just tasted Nutella for the first time quite recently, so its decadent and addicting amazing-ness had just dug a special place in my heart! ) Nonetheless, this cake seemed like the perfect embodiment of all of my sister’s favorite things: chocolate, candy, and a little bit of crunch. At first, I had absolutely no idea how I would create and decorate this cake, but I ultimately based it off of the Ferrero Rocher candy: a rich, chocolate inside coated with a layer of (toasted) hazelnut crunch. Indeed, this sinful cake surpassed my vision! The cake was light, moist, and delicious (all must-haves!) and the “Nutella Cloud Frosting” certainly tasted like a dream! 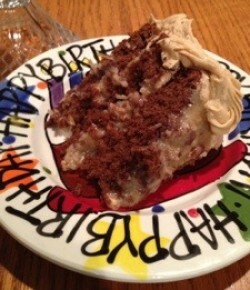 (Even as a non-frosting eater, I found myself licking my fork!) Everyone absolutely loved the cake and needless to say, it was devoured off the plate! I even venture to say this this is one of my favorite sweets I’ve ever baked…the delicious taste made it incredible, but its fantastic design made it unforgettable! Head over to At 350 Degrees to check out the recipe!